After announcing preliminary statistics earlier this year, today the International Chamber of Commerce (ICC) has published a full report of its 2017 ICC Dispute Resolution figures. For the first time, the statistical report is available to the public free of charge—in addition to being featured in the latest edition of the ICC Dispute Resolution Bulletin, which is available via the ICC Digital Library and ICC Store. Led by co-editors Samaa A. Haridi of Hogan Lovells and Julien Fouret of Betto Seraglini, the Bulletin is a one-of-a-kind publication that offers an array of material—from reporting on recent decisions and law reforms relating to arbitration in various jurisdictions to in-depth studies on specialised topics to ICC arbitral awards excerpts and more. The comprehensive report provides an overview of the record number of countries represented in ICC Arbitration cases, which confirm the ICC International Court of Arbitration’s global reach and leading position for complex, high-value disputes, reflected also in the recent confirmation of ICC as the preferred arbitral institution globally. Take a look at the report highlights. Up from 11% in 2016, the number of States and State entities that were parties to arbitral proceedings initiated in 2017 rose to over 15%. Additionally, ICC Arbitration was listed as a dispute resolution option available to parties on four cases thanks to a Bilateral Investment Treaty. In its history, the ICC Court has administered a total of 39 cases based on these types of agreements. In 2017, of all arbitrators nominated or appointed by parties, co-arbitrators or the Court, 16.7% were women—that is a 1.9% increase compared to 2016. In terms of arbitrators nominated or appointed for 2017, 249 out of 1,488 were women, with representation seen from 85 countries. Whereas in 2016, only 209 of 1,411 arbitrators were female. What is more, the Court appointed a higher percentage of women (45%) versus the parties themselves (41%) and the co-arbitrators (13.7%). Sub-Saharan Africa saw sweeping growth in 2017 with 87 cases and 153 parties, representing a growth rate of 35.9% for cases and 40.4% for parties when compared to the previous year’s numbers. Addedly, both North and Sub-Saharan Africa saw a hike in the number of arbitrators with nationalities also from those regions. In Central and West Asia in 2017, 219 parties were featured in ICC Arbitrations, showing a boost of over 26% from 2016. Ranking in the top 50 countries in terms of case numbers and the number of parties represented were Iran, Kazakhstan, Qatar, Saudi Arabia and the United Arab Emirates. Together, all five countries represented more than 15.5% of total parties. For 2017, Latin America saw an uptick of almost 8% in terms of the number of cases. More specifically, Brazil jumped to 7th place in worldwide case rankings after a case management team was established in Sao Paulo last year. Currently, the team is managing 25 cases. Expanding in the number of cases filed and parties represented, Oceania’s numbers rose by 25% and 3.4% in 2017. When compared to 2016, figures also showed an increase from the region in the number of arbitrators appointed or confirmed by the Court, moving from 49 to 56. Meanwhile, North and West Europe accounted for 784 parties—illustrating a 4.8% growth in comparison to 2016. Figures also revealed a marked increase in the number of British (219) and French arbitrators (141), accounting for a boost of more than 14% and 9% respectively. Next in the ranking of the number of arbitrators by nationality was Switzerland with 116, followed by the United States with 100 and Germany with 99. Falling from 50 in 2016 to 48 in 2017 where the number of challenges introduced. Just six challenges were accepted by the Court last year. In accordance with the ICC Note to Parties and Arbitral Tribunals on the Conduct of the Arbitration under the ICC Rules of Arbitration, the ICC Court has communicated reasons for seven of its decisions, upon the request of one of the parties (four challenges, one request for consolidation, and two prima facie decisions pursuant to Article 6(4) of the Rules). Since 1 March 2017, the date of entry in force of the 2017 ICC Rules of Arbitration, 84 requests to opt into the EPP have been submitted. To date, 25 cases, involving 58 parties from 33 countries, have been or are currently being administered under the EPP. All cases that have reached an award were concluded within the six-month time limit. Dropping slightly from 25 cases in 2016 to 21 in 2017 was the use of ICC’s emergency arbitrator procedure, involving 58 parties who represented 31 countries. Already an added 14 cases have been recorded in 2018, bringing the total number of filed emergency arbitrator cases to 84. 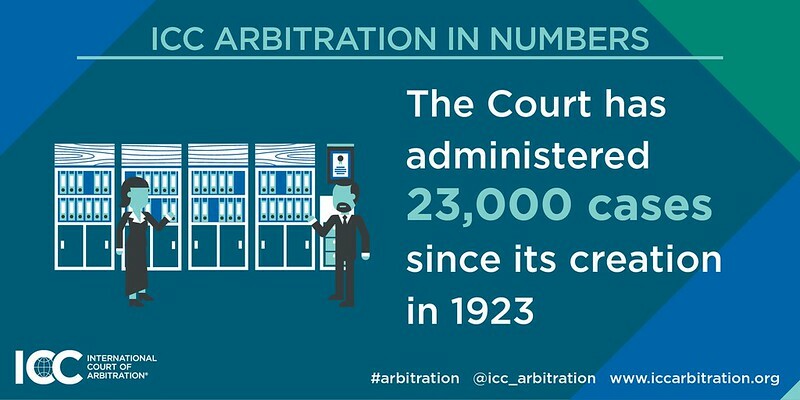 The comprehensive report provides an overview of the record number of countries represented in ICC Arbitration cases, which confirm the ICC International Court of Arbitration’s global reach and leading position for complex, high-value disputes.